My friend Christy and I hosted a little shindig here at my place last Friday morning, which of course meant a major cleaning spree for me. It started Wednesday afternoon and lasted until the wee hours of Friday morning. My efforts at making my home presentable were constantly thwarted by two small villains who not only outnumbered me, but engaged in a war of attrition by begging for crackers-cartoons-trips to play outside-more water please-no naps!-can we go to Target?-she hit me-she bit me-I want a bath, etc. Every time I would get a room picked up and put away, I'd turn to find another area of the house completely decimated. I felt like a hamster in one of those exercise wheels. And I hate exercise. Now when I say "making my home presentable," what I really mean is "making my DOWNSTAIRS presentable," because if you were to make it past me and sneak up to the second floor of my house you would assume that a family of dirty gypsy hoarders lives here rather than four wasps...three of whom have an unnatural love of shoes. Almost a week later, the downstairs is still pretty picked up. The girls have been better about putting their toys away before choosing a new activity, and I have decided that I very much enjoy sitting on my couch rather than standing next to it and wishing the pile of laundry would just go away already. Where am I going with this? I knew you'd ask. My point is that as I am cleaning up, decluttering is key. I have a nice big pile of things on my dryer that are waited to boxed up and sent off to Salvation Army. 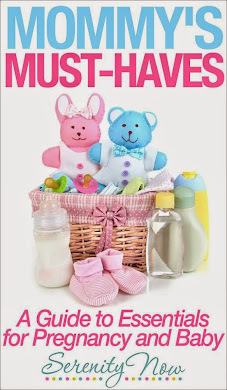 I've also come across some Blessings Unlimited products that I have duplicates of. One of my duplicates comes from this fun set of Pillow Covers. I was so excited about the fresh look and typography elements, that I ordered mine back in the winter and have been enjoying them for some time. 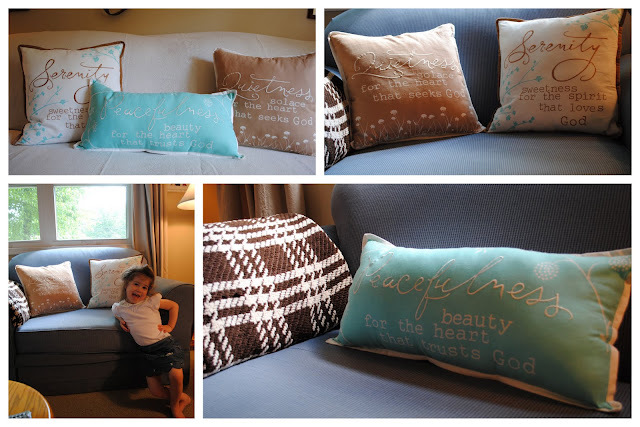 The pillow forms were an easy and inexpensive purchase from the local craft store. Here they are in my Family room! Let's pretend that I have a real slip cover, and not a drop cloth draped over my couch for photography purposes, mkay? The girls and I put together a little couch fashion shoot for you, so you can see how cute these pillow covers are! Guess what? 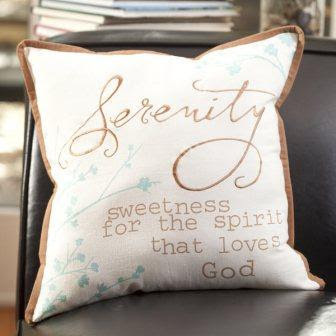 The Peacefulness Pillow Cover is only $9 this month when you click on the "Online Special" link in my shop. One lucky reader gets to have some "Serenity" (now) too! 1. (mandatory to enter): Visit my shop and leave me a comment here with the name of your favorite item (lots of new Summer product too!). 4. 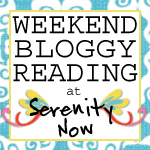 "Like" Serenity Now on Facebook, or let me know if you already do. PS. Did you see my Announcement yesterday about the next Crafty Cutter link party? I hope you'll head over next week to share a Silhouette/Cricut/Stencil/Transfer project, tip, or trick! uh-oh, did the original post and comments disappear with bloggers problems? My fave product was the large footed serving bowl. The yellow is very cheerful. I love the lazy susan! Thanks for the great giveaway Amanda! I love the Life Bread Basket! 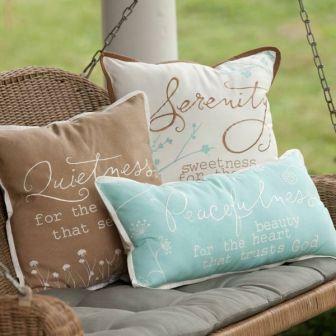 inspite of liking LOTS frm the shop - especially the bird cage!- my <3 is set on the aqua peacefulness cushion! LUV LUV LUV! World Fair Trade Day see you soon! A Few "Crafty Cutter" Highlights! Meal Planning Board Tutorial and Supply Giveaway!